The Server Message Block protocol (SMB) is generally used for accessing files, printers and serial ports within a client-server environment but it’s not commonly used for handling enterprise workloads. In this regard, Microsoft has upgraded the SMB protocol to provide a file-based access to applications data. As a result, this allowed SMB3 to be utilized in Microsoft Hyper-V and SQL Server use cases. The evolved version of SMB3 has become a vital part of Scale-Out File servers (SOFS), but this evolution has put forward certain challenges. One of the greatest challenges for companies while implementing SOFS is complexity and high CAPEX since SOFS requires some form of storage such as SAN (iSCSI/FC) or DAS. Using local storage with Windows Server 2016 and Storage Spaces Direct (S2D) solves the complexity issue. However, this lowers the solution’s ROI since S2D requires an expensive Datacenter OS license. Another roadblock is finding a storage solution that offers a unified platform with the necessary data services such as caching, snapshots, QoS and data optimization. StarWind implementation of SMB3 reduces CAPEX and eliminates the complexity issue. 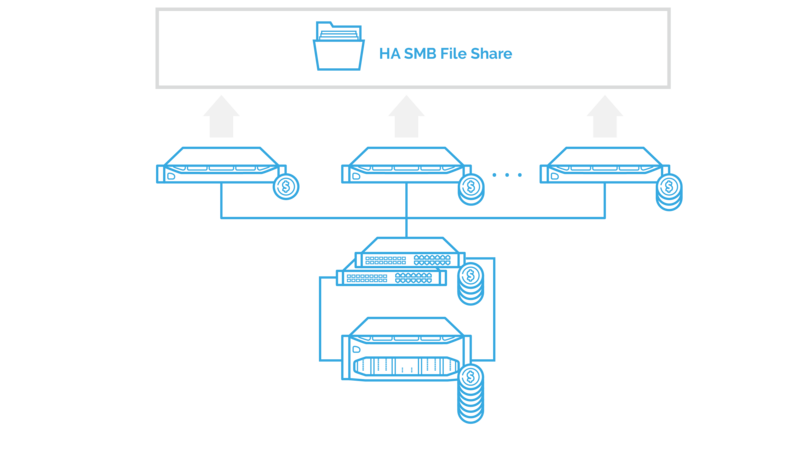 The hardware is utilized with maximum efficiency thanks to StarWind shared nothing approach. As the result, the cluster footprint is reduced to as low as 2 nodes for providing Continuously Available SMB3 access. The solution’s ROI is also significantly improved thanks to StarWind Virtual SAN high redundancy and performance architecture that uses RDMA Protocol suite and DRAM/Flash caching. Finally, the CLV gets increased as StarWind offers all the beneficial data services such as caching, snapshots, QoS, and data optimization features. StarWind makes use of the SMB3 protocol, providing simple, scalable, and highly available storage platform. It optimizes the CAPEX and increases the ROI through efficient hardware utilization. StarWind also delivers high CLV as it provides a set of data services richer than with the stock SOFS implementation.